I hoped it would be a simple fix when the customer asked me to look at her Windows 7 machine this week. I don’t really do PC repair anymore but I have one or two old customers I’ll help out when needed. I figured it was just some Windows settings that needed adjustment but after struggling with the machine for about an hour, I realized that it really needed a wipe and reload of the system. The repair shop I referred the customer to discovered hard drive issues I’d suspected but couldn’t confirm with CHKDSK. They gave her a fantastic rate on a hard drive upgrade and Windows reinstall and returned her old hard drive to her for recovery of whatever data she needed. It happens – hard drives go bad enough that running Windows is next to or completely impossible but it’s still possible to read the drive enough to pull at least some of the data from it. One option is to crack open another machine and install the old hard drive as a secondary drive and read the data that way. Not everyone has another PC lying around or the desire to open the box, however. I had the first item and the ability to do the second but I have a few old drives lying around and I’ve been thinking about getting a drive adapter that would save me time. The Unitek IDE / SATA to USB 3.0 Hard Drive Adapter was highly recommended on Amazon among all the other drive adapters and was discounted to almost 50% so I decided to try it out. This adapter supports both 40 / 44 pin IDE interfaces and SATA II drives. You can actually have three drives plugged into it at the same time if needed. The adapter also supports optical drives. This type of adapter is not a complicated concept at this point but with the number of options available, it’s nice to know that the product itself is reliable. The box includes the adapter itself (top left), the external power supply and 4-pin plug for an IDE drive (top right). Documentation, such as it is, is bottom center. The box is small and nondescript. Inside, it comes with the adapter itself, an external power supply to power the drives and a 4-pin power cable for 3.5″ ID drives. There aren’t really any instructions save for a very small two-page booklet that you will probably need a magnifying glass to read. That’s not a big issue because operation is pretty simple for anyone who can plug something in and has used a flash drive at any point. 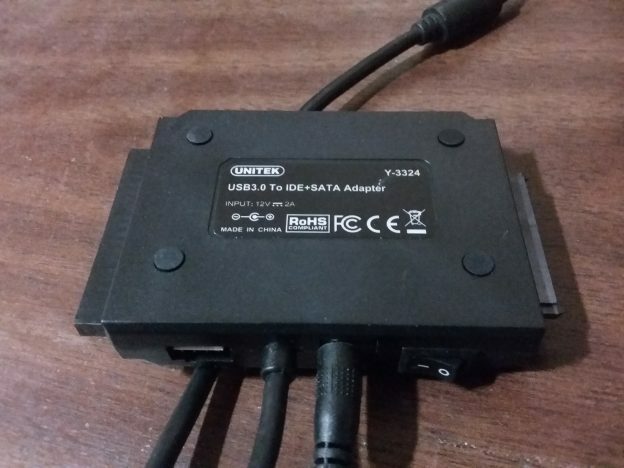 The data and power connectors on a drive are generally located on one end of the drive and are easy to match up to the correct connector on the Unitek adapter. 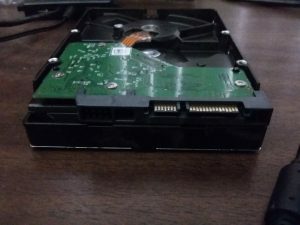 A SATA connection is shown here. Unpack all items from the box and make sure everything is present and in good condition. Plug the power supply into the adapter and then into a power strip. The connections on your old hard drive should be pretty easy to find. SATA connectors are two small groups of gold pins on one end of the drive. One group is larger than the others so it’s easy to see which way the drive should plug in to the adapter. IDE connectors have two rows of 40 or 44 pins depending on the type of IDE drive. Again, the appearance of the pins will make the connection easy to determine. The adapter has a small power switch on the side – turn it on. Plug the USB adapter into your PC and let Windows take it from there. Windows will recognize the drive and find the right drivers for it. I used the adapter on my Windows 7 laptop so, if you have 7 or later, there shouldn’t be an issue. Once everything is finished, Windows will give you the option of what to do with the drive just like it does with flash drives and other media. From there, it’s just a matter of working with the drive like any other drive on your system. If the drive is not formatted, you will need to partition and format it. Hopefully, if you’re working with a recovery drive, it’s still in good enough shape to retrieve the data you need. After you’re finished with the drive, you should right-click the icon in the Windows system tray and property eject the media as you would with a flash drive. Overall, I was happy with the performance of the adapter. 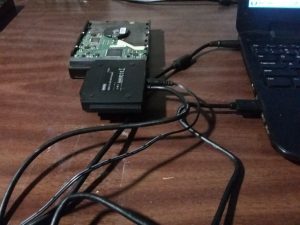 It was easy to use and I was able to quickly pull a few gigabytes of data from the drive and check out a couple of the other drives I have. This is a basic and useful tool for anyone who does PC support and I’d definitely recommend the Unitek unit based on performance, features and price. 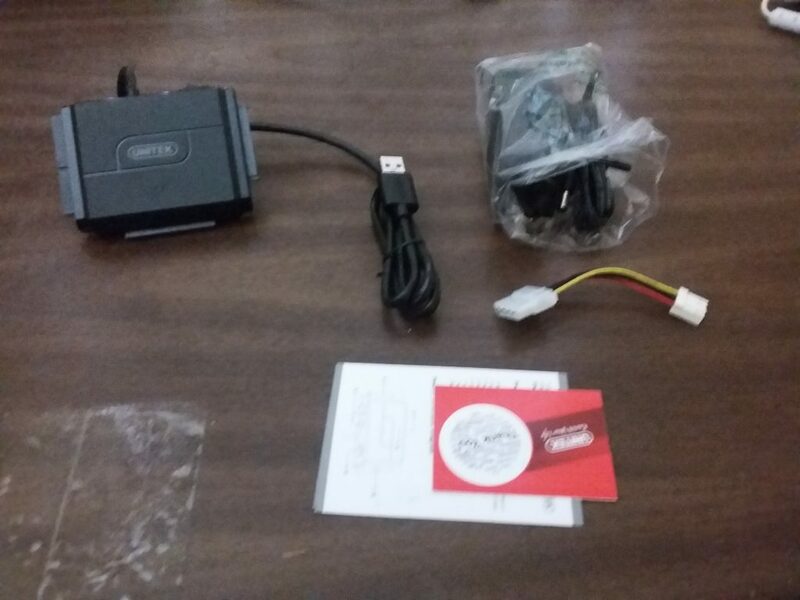 This entry was posted in Hardware, Reviews and tagged featured on March 30, 2019 by Andrew Comeau.